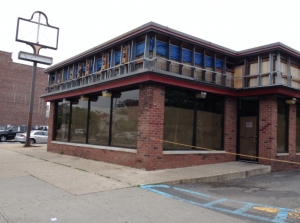 Until recently, the Wendy’s restaurant in Elmhurst, Queens, bustled with customers. But over the last few weeks, crews removed tables and chairs, ripped down signs and set up wooden boards along the perimeter. So went the demise of perhaps the most famous fast-food joint in cinema history. Eddie Murphy mopped the floors there. Arsenio Hall washed the windows. Louie Anderson worked the register, and Samuel L. Jackson tried to rob the place. The cult classic, which grossed $288 million worldwide, features Mr. Murphy as a good-natured African prince who journeys to Queens to find a queen of his own. He winds up working on Queens Boulevard at McDowell’s, a McDonald’s rip-off where many of the movie’s most memorable lines are uttered. The Wendy’s fast food restaurant location on Queens Blvd. was recently shut down. But the building, whose shell remains largely unchanged from the time the movie was shot there, will soon be razed to make way for a $105-million, six-story structure with luxury apartments and ground-floor stores, said Nick Chavin, a spokesman for developer Jerry Pi. Mr. Anderson, who played a downtrodden cashier in “Coming to America,” said he is sad to see the landmark go. “Wow! For me, it was not so much a hamburger stand as a chance to appear in a movie that became somewhat iconic,” he said. As the film continues, Akeem falls in love with McDowell’s daughter, Lisa, played by Shari Headley in her first movie role. Ms. Headley, who was 23 at the time, had a quick commute between the McDowell’s shoot in Elmhurst and her childhood home in St. Albans, Queens. But the fast-food set-up confused passersby. McDowell’s also witnessed one of Mr. Jackson’s first cinematic performances, long before his roles in “Pulp Fiction” and “A Time to Kill.” In a pivotal scene, Mr. Jackson marches into McDowell’s, fires a shotgun into the ceiling and demands the cashier empty the register. Lisa’s vain boyfriend Darryl (Eriq La Salle, of “E.R.” fame) hides behind a chair while Akeem and Semmi manage to disarm the hold-up man. The blocks around McDowell’s also made cameos in the film. A running joke in the movie surrounds a hair product named Soul Glo, which Darryl applies incessantly to his Jheri curls. The film’s director, John Landis, said the studio wanted to plaster a Soul Glo ad on a billboard at Queens Boulevard and Broadway, but the man who rented the billboard refused to give up the space. Eventually, the sides agreed to a cumbersome solution – creating the Soul Glo ad on canvas. The legacy of McDowell’s figures to outlive the building. The faux eatery has its own page on Yelp, with five glowing reviews from “Coming to America” fans from as far away as California and Texas. Online retailers also sell T-shirts with the McDowell’s logo, though the profits don’t go to the men who first imagined McDowell’s, the screenwriting team of Barry Blaustein and David Sheffield. But the writers may earn their keep yet. Mr. Sheffield revealed the pair is seeking a composer to adapt the film into a Broadway musical that would prominently feature McDowell’s. Previous PostPrevious Is It Down There?